The ideal chain is well-adjusted and lubricated. It must be free from dirt and there is an ample supply of oil or wax to lubricate it. Most bikes are using O-ring chains. 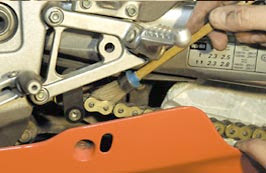 These chains come with links that have lubrication trapped inside the link at the back of O-rings. Lubricating the chains prolongs its life. Nonetheless, you need considerable amount of expert’s advice so as to perfect the art of lubricating. In this case, O-ring welcomes some external lube in order to cut down the friction on the sprocket. This way, the temperature is kept running down. Nowadays, there is what we call spray lube. It is one of the most practical lube we have today. You need spray it to the chain while the latter is still warm, like for instance after a ride. Let the carrier liquids evaporate. This will take about ten minutes or so. Apply it to the inside of the chain. You can do this by spraying it on top of the lower run and forward of the rear sprocket. Another alternative is the automatic oiling gizmo. So far, this is the best that I have ever tried. This is often used by bikes which have a drip feed to the chains. However, this is commonly used by those who have fully-enclosed chain systems. Motorcycle stores already have this product. Whether you are using the old style or the modern alternatives made available by today’s technology, the thing is, we must adjust, clean and lubricate our bike’s chain regularly so as not to be bothered by future discrepancies that can lead to terrible accidents. Cleaning the chain is not that difficult. You just have to soak rag in kerosene. Do not use petrol when you are using O-rings because this will damage the latter and dilute the lubricant. After soaking the rag, wipe it on the chain. So easy. Just don’t prop the bike on the center stand, start the engine, put it in gear and wipe the rag while it continue running, chances are your rag can be caught or worst it can toggle your hands at your detriment. Now that we realize the significance of lube, the next query is - how often must it be done? The answer will depend on your riding activities. If your motorcycle is exposed to hard, rugged and dirty ride, might as well adjust, clean and lubricate your chain as often as you can because your ride punishes the motorcycle parts including the chain. On the other hand, a weekly check is good to those bikes which are not used in active and high-performance riding. Bear in mind, that a good chain and sprocket set should do 20,000 km and up. 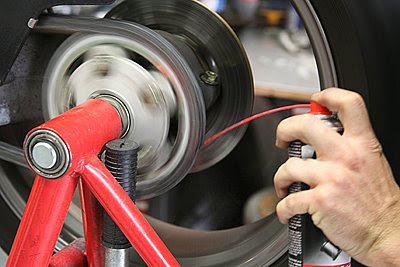 When taking care of your bike chains you need to work as cautiously as possible to lessen the chances of damaging it, and also, you should invest on a quality lubricant since it is one of the essential bike components that you shouldn't miss out on. Motor cycle is one of the major parts of vehicle, Many riders are used to using oil and extravagant product for prevent their chain from damage and dust. Những câu chuyện cười sẽ giúp bạn thư giãn và giảm căng thẳng trong cuộc sống, các truyện cười ở nhiều thể loại như: truyen cuoi tre em, truyện cười tiếu lâm , truyen cuoi sinh vien, truyện cười vova, truyện cười tiếng anh, … sẽ thực sự mang lại cho bạn những giây phút thư giãn và thú vị. Ở TP Hồ Chí Minh, cá kèo được bày bán nhiều ở chợ và việc mua sắm khá dễ dàng. Ngoài Hà Nội, để mua được ca keo người mua thường phải tới các siêu thị lớn như Metro, big C…..Cá kèo tại đây được bảo quản hoàn toàn bằng đông lạnh, giảm hẳn vị ngọt tự nhiên vốn có.